From South Africa’s acclaimed Market Theatre, the intensely funny and poignant “Sizwe Banzi is Dead” starts Feb. 25 at Syracuse Stage. In this award-winning classic about the universal struggle for human dignity, a black man in apartheid-era South Africa tries to overcome oppressive work regulations to support his family. Directing the Syracuse Stage production is John Kani, known as the “Grandfather of South African Theatre.” Kani is one of the creators of “Sizwe,” along with fellow actor Winston Ntshona and Athol Fugard, one of the world’s most revered playwrights. Kani and Ntshona performed the play in South Africa, England and on Broadway, where they won joint Tony Awards for best actor. Adding to the significance of the Syracuse production, Kani is directing his son, actor Atandwa Kani, who will perform the roles made famous by his father. Atandwa Kani will be joined on stage by fellow South African actor Mncedisi Shabangu. “Sizwe Banzi is Dead” performs Feb. 25-March 15 in the Archbold Theatre at the Syracuse Stage/Drama Complex, 820 E. Genesee St. Discounted preview performances are Feb. 25 and 26. The Opening Night performance is Friday, Feb. 27, at 8 p.m. Tickets and info are available at http://www.syracusestage.org, by phone at 315-443-3275 and in person at the Syracuse Stage Box Office (Monday-Friday, 10 a.m.-5 p.m.). Ticket discounts are available for groups of 10 or more at 315-443-9844. Discounts are also available for seniors, students, U.S. military personnel and veterans. Sign interpretation, open captioning and audio description services are available for select performances. This show is recommended for ages 12 and up. The Syracuse Stage production of “Sizwe Banzi Is Dead” is co-produced with two acclaimed theater companies: the Market Theatre in Johannesburg, South Africa and McCarter Theatre Center in Princeton, N.J. After performing in December to sold-out houses in South Africa, the work moved to McCarter in January, where it was praised as “extraordinary” (BroadwayWorld.com), with performances that “make this penetrating play all the more compelling” (The New York Times). “Sizwe Banzi is Dead” was devised in 1972 as what became known as “protest theatre.” The work was constructed to speak out against the apartheid system in South Africa, by examining the life of one man struggling to adhere to the Pass Laws. Pass Laws dictated that all black people over the age of 16 carry at all times a government issued identification called a pass book, which indicated where an individual could live and work (StageView). 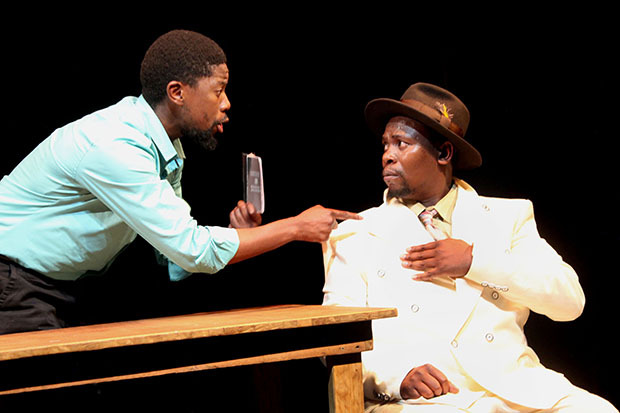 Kani felt this first hand as some people in South Africa did not approve of “Sizwe.” While working on this play and others, he was often detained by police. Once, shortly after winning the Tony Award, Kani and Ntshona were arrested and placed into solitary confinement. The arrests sparked outrage from artists around the world and they were eventually freed. However, in 1985, Kani was stabbed by police and only narrowly escaped with his life (Program Book). After the death of Nelson Mandela in December of 2013, Stage’s producing artistic director, Timothy Bond, reached out to John Kani about directing a revival of “Sizwe.” The arrival of this production in Syracuse marks a continuation of Stage’s partnership with South African theaters that began with “The Brothers Size,” which transferred to the Market and Baxter theaters in 2012.